Israel Braces For More Protests By Minority Ethiopian Community : The Two-Way Security forces have been deployed in Tel Aviv and Jerusalem to try to prevent further violence after police and protesters clashed Sunday at rallies to protest police treatment of Ethiopian-Israelis. 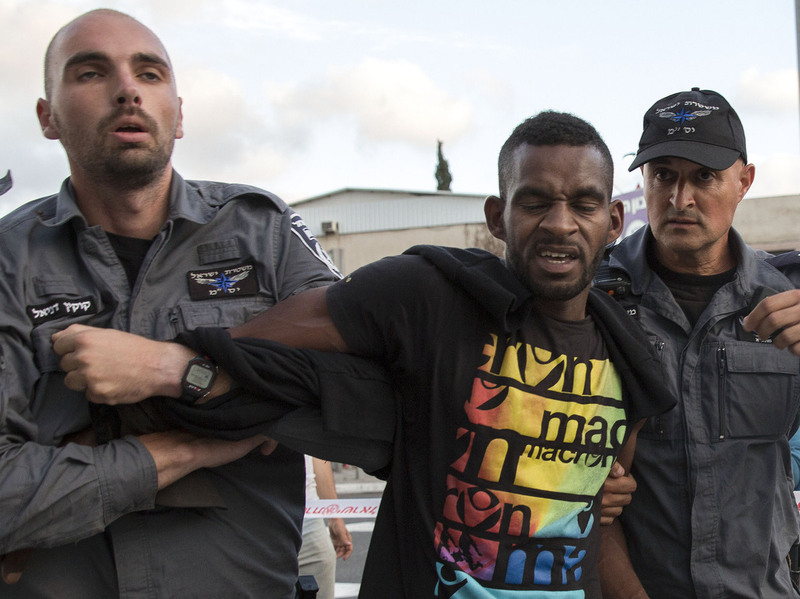 Israeli police officers detain an Ethiopian-Israeli during a demonstration Sunday in Tel Aviv. Israeli leaders are urging calm after violence marred a night of protests in Tel Aviv by the country's Ethiopian community. Dozens of people were injured, including many police officers, and dozens were arrested, according to news reports. NPR's Emily Harris reports that people protesting treatment of Ethiopian-Israelis chanted peacefully near Tel Aviv City Hall on Sunday. "Later, police and demonstrators fought — with stones and bottles, tear gas and flash grenades," she says. The protesters shut down a major highway in Tel Aviv and overturned a squad car, according to The Associated Press. Haaratz newspaper reports that police were deployed in Jerusalem and Tel Aviv in anticipation of more protests Monday. Israel's ceremonial president, Reuven Rivlin, said Monday that the protests by Ethiopian-Israelis had "revealed an open and raw wound at the heart of Israeli society" and that the country must respond to their grievances, according to The New York Times. But Rivlin condemned the violence. Sunday's protest followed a smaller one in response to a video showing police punching and beating a young, uniformed Ethiopian-Israeli soldier. The video went viral on the Internet. Prime Minister Benjamin Netanyahu met with the leaders of the Ethiopian community Monday, and with the soldier seen in the video, Damas Fikadeh, at his Jerusalem office. Netanyahu later tweeted that he was "shocked" by the video, adding, "We cannot accept it, and we will change it." The beating was not an isolated incident, according to Haaretz. Israelis of Ethiopian descent have for years complained about harassment, brutality and discrimination. Ethiopians began moving to Israel about three decades ago after rabbis decided they were descendants of a biblical Jewish tribe. The community now numbers about 135,000 people. But according to The Ethiopian National Project, Ethiopian-Israelis have a lower income than other Israelis, have less opportunity for higher education, and are more likely to end up in prison. Occasionally, discrimination veers into outright racism, such as in the 1990s when it was discovered that Israel's health services threw away blood donated by Ethiopian-Israelis out of fear that it could be contaminated with HIV, Reuters reports. As Emily Harris reports, many in the Ethiopian community are drawing parallels to protests over police treatment of African-Americans in U.S. cities such as Baltimore. Emily talked with Alemo Fahada, who recently finished his tour of duty as an Israeli soldier. He says he is tired of discrimination against dark-skinned Israelis. "We want to stop this. This is going more than 25 years, and nobody says nothing," Fahada said. "For the government, we are black people. ... We are nothing for them."